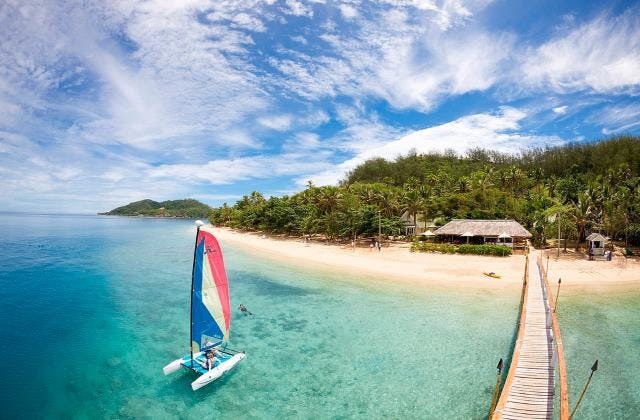 Nadi is the third largest township on the island of Viti Levu in Fiji. Located on the western coast of the island with beautiful ocean views. Nadi has many hotels and motels to accommodate visitors to this extraordinary place. With a beautiful mix of mainly Indian and Fujian peoples, the art and culture are Hindu and Islam influenced with amazing temples on the island. Due to its tropical climate and paradise like features, Nadi beckons visitors from all over the world to come explore her beauty and enjoy her tranquility. Ferries can be taken to nearby islands and resorts surrounding Nadi, which also has an international airport and botanical gardens. Nadi is the perfect mix between urbanism and paradise. The nearest hotel to Nadi airport is The Raffles Gateway Hotel. The cheapest airfare to Nadi is $822 leaving from Albury.